Other mistake: Johnny Brown is serenading Molly in the meadow as she sits up on the branch of a tree. In shots where we are looking down on Johnny (from over Molly's shoulder), the shadow of the canopy that protects the actors from the sun can be seen as a perfectly straight line on the ground, behind Johnny. The shaded/unshaded areas move as the canopy shifts in the breeze. 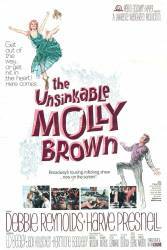 Character mistake: The movie opens with the infant Molly Brown in a basket being swept down a raging river. She crashes and crawls up on the bank. No one else is around. But when the grown-up Molly tells her "pa" that she's going to Denver, she says, "Thank you for pulling me out of the flood." Molly Brown: What's that mean? Best regards? 'Leadville' Johnny Brown: Well it means not just 'regards', but best regards.